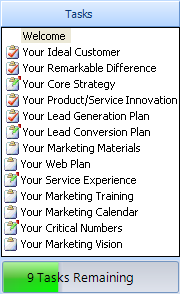 Users of Marketing Plan Pro Powered by Duct Tape Marketing will be happy to learn that nine new sample plans are now available in the software. To access the new plans, open your Sample Plan Browser, and click Refresh List. Remember, you can view any sample plan as a PDF, or open it up in the software to edit and make it your own. Click here to learn more about Marketing Plan Pro Powered by Duct Tape Marketing. The table list now includes a number of additional marketing planning tables, including Channel Analysis, Customer Lifetime Value, Market Demographics, ROI Calculator, and more. Click the name of any table to open and use it. This table allows you to compare the costs of acquiring a new customer to the overall Customer Lifetime Value (revenue from that customer). In most businesses, you hope to sell your products or services to a customer not just once, but several times over the course of several years. Adding up these sales over the entire customer lifetime and then subtracting what it costs to acquire the customer gives you the total customer lifetime value. The final rows calculate an adjusted value to take into account the present-day value of future income. The example below shows a plan for selling high-end services to other businesses. 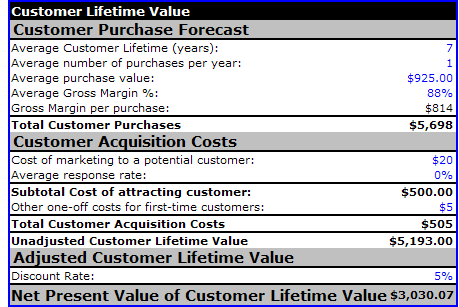 Customer Lifetime refers to the number of years from initial purchase to final purchase. While some major brands or stores are lucky enough to have a customer lifetime of over 30 years, most of us are looking at significantly less, from 1/2 to 5 years. Costs of Marketing to a Potential Customer means just that – potential customers, not actual customers. If you spend $5,000 on marketing aimed at 1,000 potential customers, this figure would be $5, even if only 1 person out of 1,000 responded. This table is not part of the standard Marketing Plan Pro Outline. You can use it behind the scenes, or insert it into your Outline to include it in printed output. Whether you’re getting started quickly with a 30-minute plan, or exploring your marketing efforts in-depth with the full Standard outline, Marketing Plan Pro powered by Duct Tape Marketing lets you easily note your progress. The built-in Tasks bar shows you how far you have come and how many Tasks you have left to complete. Each task in the Tasks list includes a progress status button, next to the Previous Task and Next Task buttons at the bottom of the screen. By default, each task is listed as “Not Started.” As you work on each table and topic, the status becomes “In Progress.” You can track your progress through the Tasks list by marking items as “Complete” when you are finished with them. Task icons in the Tasks list will reflect each item’s status – a pencil shows the task is in progress, while a checkmark indicates the task is complete. If you’re just starting out with the Duct Tape Marketing System, chances are you will focus most closely on the next 12 months, during which you make marketing integral to all your small business activities. However, if your business is seasonal, and your marketing promotions include seasonal events, you may want to use the option for planning your second year of sales and expenses in monthly detail, as well. Your Sales Forecast and Marketing Expense Budget table spreadsheets will now include a tab to toggle between 1st Year Planned and 2nd Year Planned forecasts. If you are using the table wizards to fill in your numbers, the wizard will automatically prompt you to fill in the second year of monthly data as you go through it. Did you know you can customize your plan Outline in just about any way imaginable? Right-click on any topic in the Outline, and you’ll see options for renaming, deleting, and moving topics. You can also insert new, custom topics, totally defined by you, or insert charts or tables in new locations. In addition, when you’re printing, you can choose to print only selected items from the plan. The Table of Contents will automatically adjust on the fly to list only the items you’ve selected. Need more detail in a Sales Forecast? Want to track a number of different Milestones? No problem. Most tables with data-entry areas allow you to insert new rows, which you can name and format.